Hormones are natural occurring substances in your body made from cholesterol. They are know as "chemical messengers" or signaling molecule. Each hormone has a specific purpose that it performs, and they are specifically secreted by endocrine organs in response to it's environment to perform this purpose. If our environmental is optimal (ie. perfect diet, no stress, no inflammation, etc.) then our hormones are in good balance and performing optimally. It is when the hormones are imbalance that health issues may arise. The important thing to determine with hormonal imbalances is which (or how many) hormones are out of balance and in which endocrine organs do the imbalances come from. 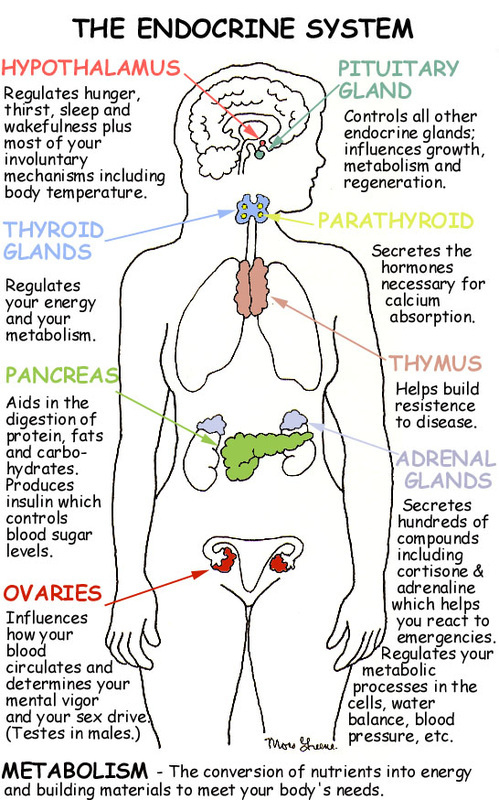 All endocrine organs are connected, hence the imbalance can originate from any number of hormones. ​Acupuncture can be used to synchronize and balance hormones, as well as acupuncture specific for fertility and improving conception. Nutritional Counseling can be use to detect food sensitivities, and help the person incorporate an antioxidant and anti-inflammatory diet, especially if there are issues with fertility. ​Homepathics and Biotherapeutic drainage can be used to detoxify the body from hormonal excess and liver sluggishness. ​Stress Reduction exercise can help improve the relaxation of the body and mind, having a direct positive effect on hormonal levels.